To search for susceptibility genes and loci for nicotine addiction, many genetic approaches have been used, which include genome-wide linkage, candidate gene association, GWAS, and targeted sequencing. Through these approaches, many genes and chromosomal regions have been revealed. 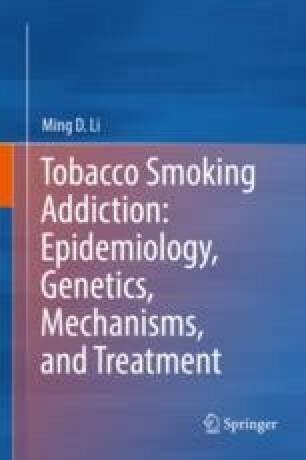 In this chapter, we first summarize the literature on genetic studies for all smoking-related phenotypes using different approaches by highlighting the converging results obtained by different approaches and then offer new hypotheses that have emerged across the allelic spectrum, including common and rare variants. It is our hope that the insights we obtained by putting together results from diverse approaches can be applied to other complex diseases/traits. In sum, developing a genetic susceptibility map and keeping it updated are an effective way to keep track of what we know about the genetics of smoking addiction and what the next steps might be with new approaches. This chapter was modified from a paper reported by our group in Molecular Psychiatry (Yang and Li 2016). The related contents are reused with permission.